Hello, and welcome to Reading with your kids podcast! 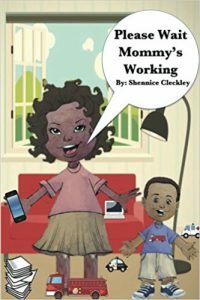 We are beyond excited to chat with author & mompreneur Shennice Cleckley. Shennice is joining us to talk about her new children’s book series “Mommy and Lewis” . Listen as Shennice shares her insights on being a stay at home mom, entrepreneur & how her books focuses on the love in a blended family. Shennice has released three books in her series so far including Please Wait Mommy’s Working, Meet Lewis’ Big Family & Mommy & Lewis ColorIng Me Fun. We love, Love, LOVE Mommy and Lewis series & we know you are going to love this interview. Be sure to tune in! Shennice Cleckley aka “Mommy” is a Mompreneur who owns a portfolio of brands that help women start and grow their business. She is a sought after speaker, author, relationship coach and entrepreneur. She is also the founder of My Dessert Bar dessert and catering company and Our Marriage Rocks, marriage enrichment firm. Shennice and her husband LeBrian have 4 children: Adrienne (28), Kiersten (20), Jared (16) and Spencer Lewis (4) and a granddaughter Cassidy (6). As a certified foodie and coffee snob, Shennice takes her eating seriously. Her day after she drops off the kids at school, usually starts off with a little devotion, a bit of nourishment and a lot of caffeine. Lewis wants to play rescue ranger with Mommy but Mommy must complete her work. Mommy is mompreneur who is juggling mom-life and work-life. Discover how Lewis and Mommy make it all work together. This book helps kids discover why parents work from home. 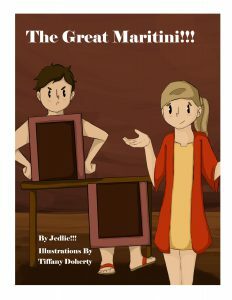 Have fun with your favorite Mommy and Lewis Books characters. Enjoy coloring sheets, mazes, connect the dot and matching games for loads of fun. Lewis loves his family. Lewis tells the reader that a family is a group of people of love you and take care of you. He is from a blended family. 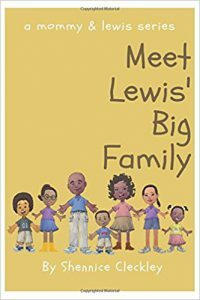 Meet Lewis’ Big Family introduces the concept of family structure, pride in family and familial names. The book explains one concept of blended families and how regardless of how your family is formed or looks they still love you. In this episode, Shennice discusses all her books in Mommy and Lewis series & explains how these books will helps kids discover why parents work from home. She also shares with us how in real life, Mommy and Lewis are Shennice Cleckley and her son Spencer Lewis. Shennice describes how she has learned to find harmony with her work-life and home-life & gives us a sneak peek of upcoming books in the series and more. Be sure to Listen to this episode & feel free to share! PreviouslyPower Down & Parent Up!! !